THE WINNING TEAM  Flagger Moms Cheri Corless, Raylene McKay and Darci Fullerton (front, left to right) pose with the crystalline trophy awarded by the National Safety Council and the American Road & Transportation Builders Association. In the back stand Laborers' Union Local 169 Business Manager Richard "Skip" Daly and his predecessor, Dan Rusnak, right, who initiated the safety program in 1994. Rusnak retired in 2001. The campaign was written and produced by Andrew Barbano of Deciding Factors (CWA 9413 signatory), agency of record since the campaign's inception. Washington, D.C. [May 23, 2001]  Public and private transportation professionals and news media outlets were recognized for their commitment to safety at the American Road & Transportation Builders Association and National Safety Council inaugural "Roadway Work Zone Safety Awareness Awards" banquet. The awards were presented May 11 at the International Roadway Work Zone Safety Conference, held in St. Louis, Mo. The awards competition recognizes specific programs, education campaigns, news stories or article series that demonstrate excellence in promoting safety in roadway construction zones. Program award categories included: Government Outreach, Private Outreach Campaigns and News Media Coverage. Private Outreach Campaigns. This category recognizes the efforts of national, state and local private sector organizations, such as construction companies, utility companies or trade associations, that promote roadway work zone safety through implementation of employee and/or public education campaigns and training programs. First Place (Tie): Tennessee Road Builders Association (TRBA), Nashville, Tenn., and Laborers' International Union Local 169, Reno, Nev. TRBA produced and distributed "The Other Side of the Barrel," a 10-minute video that is part of a statewide safety campaign to encourage safe driving in highway construction zones. The video was added to Tennessee's drivers education curriculum and reaches more than 25,000 students each year. Laborers' International Union Local 169 initiated "The Flagger Moms of Orange Cone Hell," an innovative public relations campaign to educate the public about the hazards of road construction zones. Dan Rusnak, a member of the Laborers Union, initiated the program after one of his members, a construction flagger and mother, was killed in a 1993 construction zone accident in Reno. The campaign included newspaper editorials, op-eds, bumper stickers and an educational website. It also featured compelling public service announcements by "flagger moms" telling in their own words about the about the dangers, safety and family issues associated with road construction sites. The program has elevated awareness to new levels in the northern part of Nevada and there have been no union flagger fatalities since the program was initiated in 1994. Celebrating its 100th Anniversary in 2002, the American Road & Transportation Builders Association is the only national organization that exclusively represents the collective interests of all sectors of the U.S. transportation construction industry before the White House, Congress, federal agencies, media and the public. The U.S. transportation construction industry that ARTBA represents generates more than $185 billion in domestic economic activity annually and provides employment for more than 2.2 million Americans. The National Safety Council is a not-for-profit, nongovernmental, international public service organization dedicated to protecting life and promoting health. The NSC estimates that 4.2 million lives have been saved through improved safety practices since the Council was established in 1913. 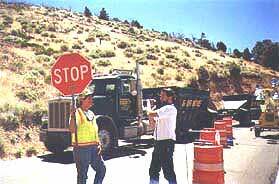 RENO (Sept. 26, 1999) - KTVN TV-2's longrunning "Face the State" program has devoted an entire broadcast to road construction zone safety. With two Nevada highway workers killed in the past month, organized labor, construction and government officials have launched a new safety campaign to heighten motorist awareness of the dangers. KTVN news anchor Chris Murphy interviewed Laborers' Union Local 169 member Darci Fullerton and Nevada Dept. of Transportation public information officer Scott Magruder. The program showcased a new media campaign entitled "Flagger Moms," the latest in a longrunning series of media efforts to educate the public. Mrs. Fullerton worked as a construction safety flagger for eight years before withdrawing a few weeks ago due to the constant stress. She was hit by a vehicle and injured on the job last year. The campaign attempts to humanize the workers in the eyes of a motoring public increasingly prone to carelessness, aggressiveness and road rage. WHO THEY WORK FOR  Even back at the old homestead, flagger moms are never far from heavy equipment. Standing, left to right, longtime flagger moms and best friends Raylene McKay and Darci Fullerton, who holds her daughter, Montana. In the foreground are Fullerton's daughter, Ashley (at left), and McKay's daughter, Kelsey. Fullerton, Cheri Corless and Raylene McKay are young mothers, good friends and highly experienced safety flaggers. Each has personal experience with injury and death on the job. All were close friends of construction foreman Jefferson Joe Turner, a 36 year-old father of four killed when struck by an auto near Hawthorne, in west- central Nevada, on Sept. 8. Fullerton's husband was at work on the same job at the time of the accident. All three women attended Mr. Turner's funeral in Carson City on Sept. 13. On one of her spots, recorded unrehearsed at a jobsite, Mrs. Fullerton says "people show cones and barrels more respect because we have the potential to move out of the way." Mrs. McKay pleads for motorists to recognize highway workers as people with families who love them. She tells how her daughter fears for her mother's safety every day, especially after McKay was shot at several years ago. Mrs. Corless emotionally relates the story of a friend and co-worker who was run down and almost killed. The nine new television spots were completed before Mr. Turner's death. In August, a 27 year-old man working as a safety flagger on an NDOT project was killed on US 95 outside of Beatty, north of Las Vegas. The cooperative safety campaign is now in its sixth year. 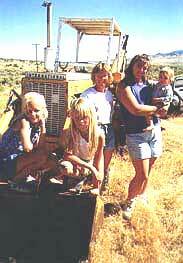 It began in 1994, spurred by the 1993 death of Laborers' Union member Tammy Coker near Fernley, east of Reno. Coker died when a sleeping motorist hit her. NDOT worker Frank Fuentes was killed on the job several years later in Las Vegas. Laborers' Union Local 169/AFL-CIO, along with other elements of organized labor, has supported paid media schedules to carry the message of construction zone safety to every part of Nevada. NDOT has provided production assistance and distribution of public service announcements. For the past 18 months, the campaign has featured "double penalties in work zones," emphasizing the increased fines for speeding imposed by the Nevada Legislature. That aspect will remain part of the mix. The union, of which all three flagger moms are longtime members, produced "double penalties in work zones" bumper stickers which were widely distributed and offered free over the Internet while they lasted. "If we can't go with old fashioned values, we'll go with 90's values and that's your pocketbook," Mrs. Fullerton stated on Face the State in response to a question from KTVN's Murphy. At a press conference kicking off the campaign, Cheri Corless said the double penalty law has helped in high-speed zones, but cautioned that slower areas are just as dangerous. On November 4, 1998, flag supervisor Clifton R. Apple, 47, had stopped traffic at a road construction project on the winding Mt. Rose Highway near Reno. A stopped vehicle accelerated suddenly, first pinning Apple on the hood, then catching his foot under a wheel. Apple was whipped onto the asphalt. His hard hat probably saved his life. Vinson Darrell Knight was apprehended in California and returned by authorities to face felony charges of battery with a deadly weapon (a 1978 Volvo) and leaving the scene of an accident. Washoe District Judge Stephen Kosach ordered a psychiatric evaluation. Mr. Knight was found mentally incompetent to stand trial and remains in the Nevada Mental Health Institute in Sparks, Nev., according to the Washoe County District Attorney's office. Mr. Apple, a member of Laborers' Local 169, still suffers from his injuries and has been unable to work since the incident. UPDATE  While the local has not lost a member since the media campaign began, Laborers' 169 members have been struck by motorists in 2000, 2001, 2005 and 2006. With the earlier cases, charges were filed and the offenders convicted in Reno and Carson City courts. Union members testified. Other cases are pending. Road building and repairing has long been one of the most dangerous occupations in the country. NBC News reported on May 26, 1999, that of the 7,500 killed in road construction zones in the past decade, four of five were motorists. The original focus of the safety campaign emphasized the danger to drivers and passengers, but the increasing violence toward workers has resulted in the current campaign's attempt to humanize them as spouses and parents. NBC also reported that 59 percent of the nation's major roads are in need of repair. Nevada, as the fastest growing state, has seen a huge influx of both population and federal highway funds. The two factors have combined to increase both the number of construction zones and the potential for accidents.